A day on the urban farm. The morning routine has changed. I am awakened by my hens clucking to me to open their coop so they can begin their day of scratching and pecking. I’ve always been part roosterette myself so I don’t mind that this begins the second the sun has peeked over the far off hills. The coop and run are near the bedroom and we sleep with the windows open and the bed under the windows. I almost feel like I’m in the chicken house. I need to have them close to me because I’m a worried hen and I want to see when the neighborhood cats decide to have some fun so I can run out there and turn the hose on them. That is how my day starts, either the girls wake me or I wake up and wonder why they haven’t started clucking yet because sometimes I actually beat them to the sunrise. I go out in my long cotton night gown looking like a 19th century woman. The flip flops update my morning wardrobe. Lately, I wear Joette’s garden clogs because the hens like to peck my toes. I throw out the crumble and scrapes from the night before. I always have veggies, greens, and fruit to give them along with their feed. I throw out some oyster shell because their eggs are thin from the factory diet, which was probably hideous and cheap food. The hens already look so much better. Joette would rather have fat Rhode Island hens that are very pretty and give lovely brown eggs. My white hens always look dirty and the eggs are white and look store bought but I adore my girls already and, although it makes me a bit nervous, I love how they run to me and gather around to see what activity or snack I have planned in the yard. The flies are hideous and I’ve been on many chicken sites to find the cure to this issue. Suggestions have been Fly Predators, Trap n’ Toss, even Vanilla scented car tree air fresheners. There are bacterial sprays such as PSP Premise Insect Control Agent. So far I am using the Trap n’ Toss and it seems to have reduced the flies by more than half…and then sometimes not much at all. It’s a hideous little concoction and I bumped into the container hanging from the tree in the chicken run this morning and had it running down my back. Another good thing is to have a small compost in the pen and put it far down the way. Rake up the poop, hay, and left over scraps daily to clean the area. I change out the straw in the coop every few days and throw the straw and poop on my strawberry bed each time. I have a few items on order, one of them being the Fly Predators. Today Joette and I put in our winter garden. We brewed our coffee, got out the packets of seeds and planned what would go where. I actually started a journal to draw out the garden beds and what is planted where because I never mark things and quickly forget. We planted peas, lettuce, spinach, beets, carrots, Chinese egg plant, cauliflower, and beans will be tomorrow. My kind and good husband built me a fence around my garden beds because that darn cat, Maggie, was using the beds as a fantastic litter box. For lunch, Joette dreamed of a tomato and avocado sandwich with some of the sprouts I had grown in the kitchen window. We had no bread and since we are trying to be very old fashioned, a day of making bread and cooking followed. We had some left overs to devour and I tried a new bread recipe. The stove smoked up a storm on the preheat so an oven cleaning was needed before we continued. We had no oven cleaner and all for the best since it’s so toxic. We Googled a recipe with baking soda and vinegar and it worked great. It is an overnight recipe but we only had so much time since the bread had already risen twice. Make a paste with water and baking soda and smear all over the stove. Let sit over night. Spray with vinegar the next day and wipe off. We only had a half hour and it did a great job. Our sink in the kitchen was leaking and the bathroom sink backed up. After many self-invented methods by Bali to snake it and such, we called in a professional. The pipe under our kitchen sink had cracked. It must have been 70 years old and had earned a retirement. This house has been so good and so far only cost us $180 in plumbing in the past few months. Old homes were built so solid and well. There was a lot of cooking, eating, baking, washing sinks full of dishes, sweeping, talking, working in the back yard, and then afternoon coffee, a bad movie with Sally Field and folding laundry that had dried almost instantly in the heat on the outdoor line. Hello, My Name is Doris, this is a strange film. I’ve been getting back to movie watching lately and have watched some really good ones. This one was weird and uncomfortable, skip it. And of course, the hens were misted, under the coop wetted down to cool it and I threw some frozen blue berries, strawberries, and bananas out there as an afternoon cooling treat. Only 2 eggs today. 4 yesterday. It’s after 8 pm now and Bali is cleaning up outside. I’ve watered the front and back, cleaned up and rearranged the back area, planned more garden work tomorrow with all my containers. That darn square patch of cement in my back yard makes me crazy. I want it removed and I’m trying to get Bali warmed up for using a jack hammer on it. All I can think of is all the more garden space. I chatted with two of my neighbors when watering the front yard and waved to another neighbor. It’s very 1950’s over here. Mostly because my neighbors are mostly elders. They come from a time when you had the phone on the kitchen wall or had to find a pay phone to make a call away from home. The younger neighbors keep to themselves and their windows and curtains are closed. Us older folk are out in the evening gossiping and sharing advice on gardening over the fence. 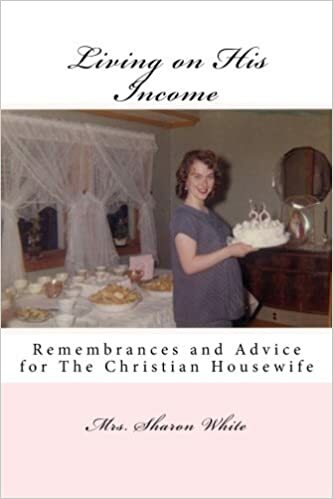 Read a charming little book that talked about being a housewife the old fashioned and Godly way. Very sweet and short book. It made me really re evaluate my work as a housewife and mother. It also encouraged me to be more diligent with our funds, using what we have and making things from scratch. Although I do run my home in a very old world style more each day, I could do better. Joette and I discussed the next items on our homesteading list and crocheting and canning are the next on my list along with sewing. I know how to crochet squares and long scarves but I only know one stitch. I’d like to learn maybe two more stitches. And hats, I’d love to learn how to make a hat. It feels intimidating. Canning is intimidating. I will boil but not pressure can yet. Baby steps. I have a sewing machine and would love to start with making an apron for me and the boys. Sammy, especially. He loves being in the kitchen and I want to encourage that. The night wrapped up with a little tidying, setting out a plate of food for Bali, reading a couple night time books for Sammy since Arjan fell asleep before I came in the room. I always look forward to my big, soft bed and cuddling with the boys all night. I look forward to the morning and all the fun things we will do tomorrow. Planting the rest of the beans is on the list and taking Joette to JoAnne Fabrics because there is a discount. She will show me how to sew and make the aprons (threading the machine is the real issue). Life as a simple little backyard farmer and homemaker is the best life and career I’ve ever had. Previous Homeschooling the easy and joyful way. Next Free romance this weekend. I have seen Mrs White’s book on her blog, but I hadn’t ordered it. I probably will now that I know you like it–we seem to have similar tastes in homemaking books. Have you considered just putting a thick layer of soil over the concrete, then building raised box beds on top of that? It would save you from messing with a jack hammer for now. That would be a lot of work in itself. I painted it the color of dirt and I need to create some sort of sitting and container gardening area. It’ll keep me preoccupied right? I really enjoyed Mrs. White’s books but they are all from her blogs. Hey, I do my chickens in my nightgown too! Loved your article in Womans World Magazine. I also have many of your books on my iPad Kindle app. We had bad fly problems too. Several golden orb spiders moved in, which helped but not enough. We tried diatimatious earth, which helped some more. In the end it was all about cleaning the coop CONSTANTLY! Started a manure pile, which is great for the garden, but it relocated the flies. So I started covering it in pine shavings, which helped a lot too. Hay and straw too. Thank you for the input. The fly situation takes a bit away from the charm of backyard farming.